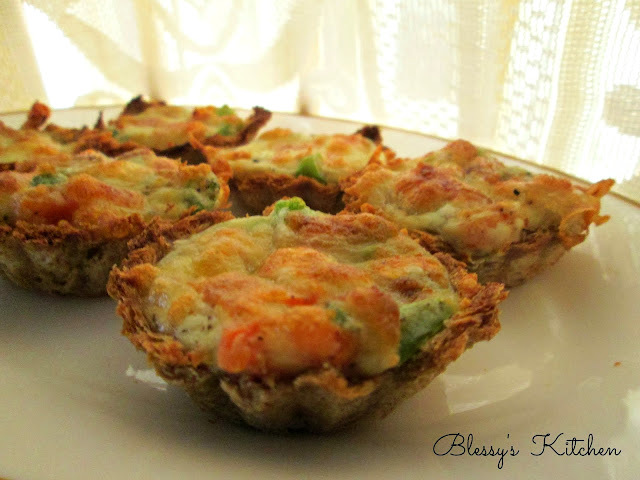 Bread Bowls are a very delicious snack and are fun to make. 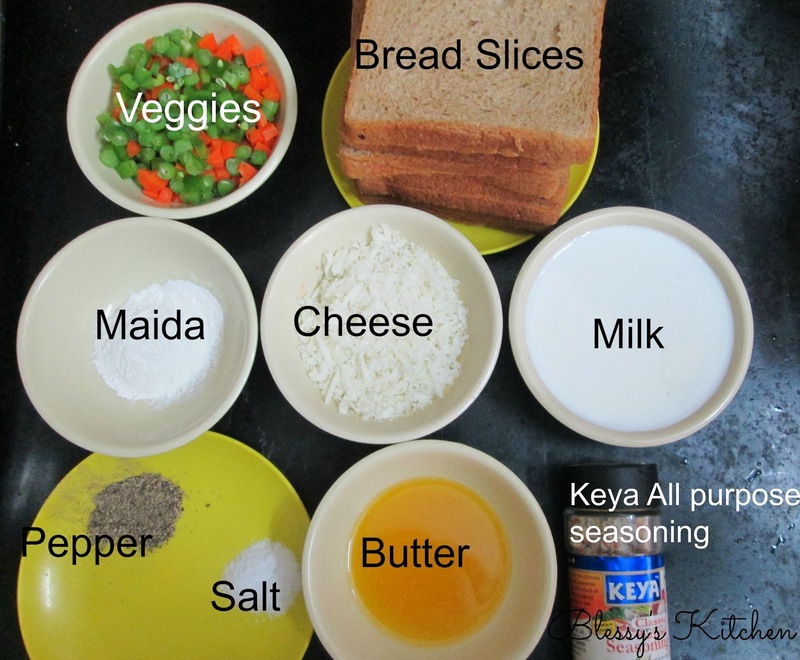 The bread bowls in this recipe are made with vegetables but you can make chicken or lamb bread bowls by adding meat to the white sauce which will be our main stuffing in this recipe. Start by taking a slice of your choice of bread. I used brown bread. To make a bowl from the slice of bread, slightly flatten each bread slice with a chapathi rolling pin. After rolling out all the bread slices, apply butter to your molds (I used cup cake molds) and gently press the bread slices into the mold and tear away the excess part of the bread which can be later used to make pudding or bread sweet. Now, bake these bowls at 150 degrees Celsius for 5 minutes. Meanwhile start preparing the stuffing for the bowls. 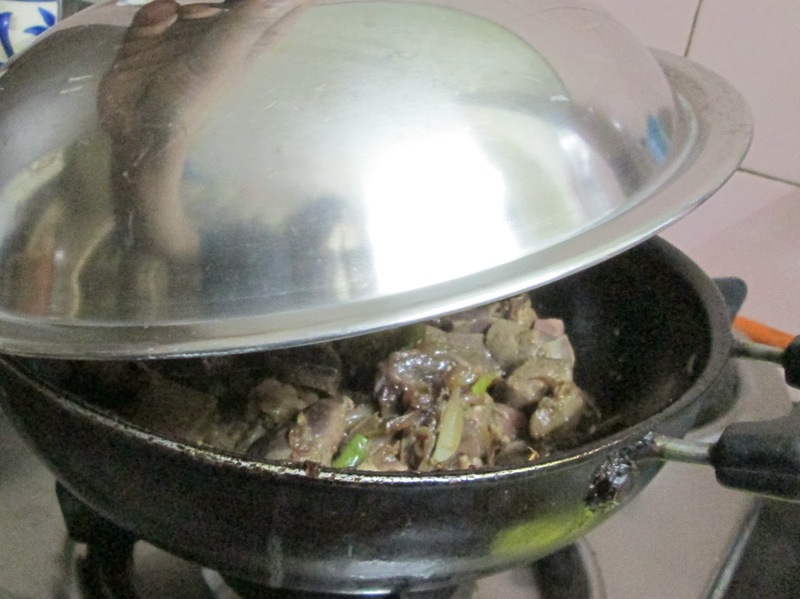 To a hot kadai, add butter (use cooking butter which is white in colour for good white coloured sauce. I used zero cholesterol table margarine) followed by maida. Stir the maida and butter mixture continuously on a low flame so as to not form lumps. This mixture is called 'Roux' (pronounced as 'Roo'). When this mixture starts thickening, add milk. 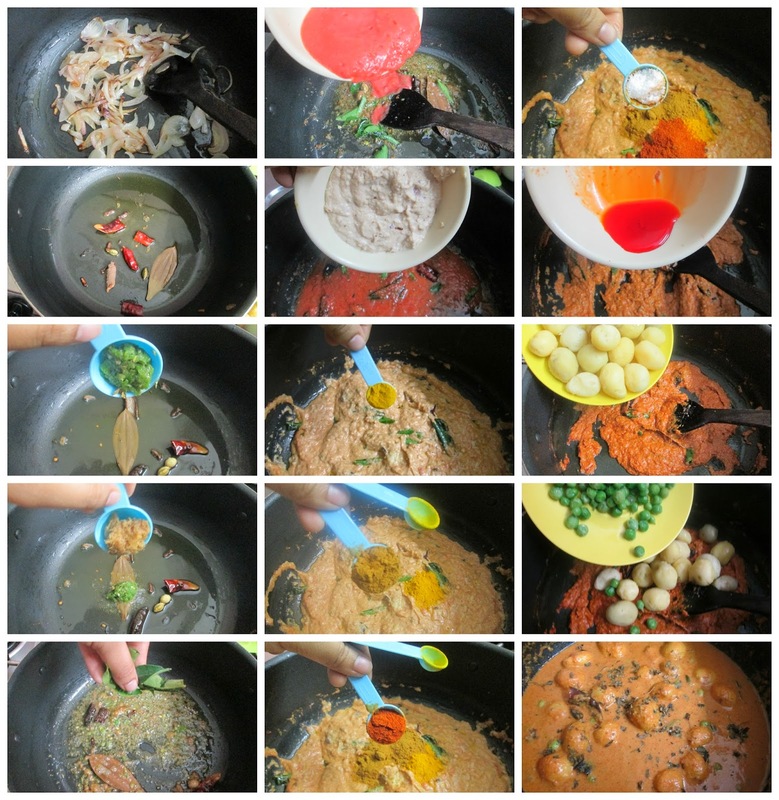 Cook it until the whole mixture slightly starts thickening.This is called 'White Sauce'. To this sauce, add vegetables, salt, pepper and keya seasoning. Cook the whole mixture for a minute or so. 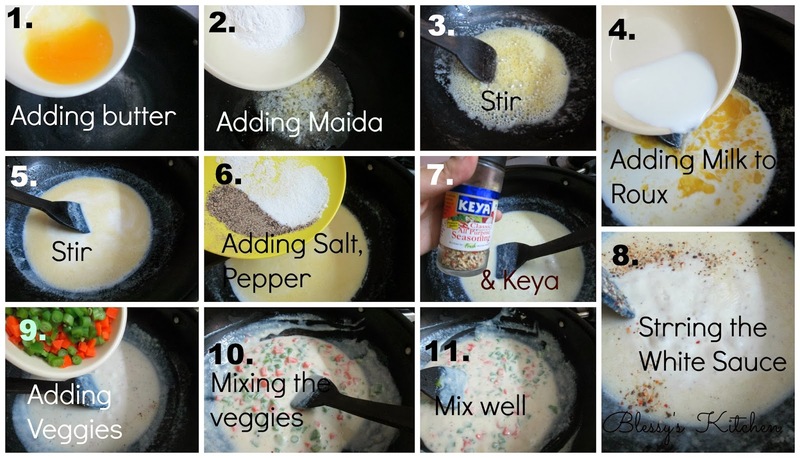 * If you choose to make a chicken bread bowl, add precooked chicken to this white sauce. Now, remove your baked bowls from the oven . 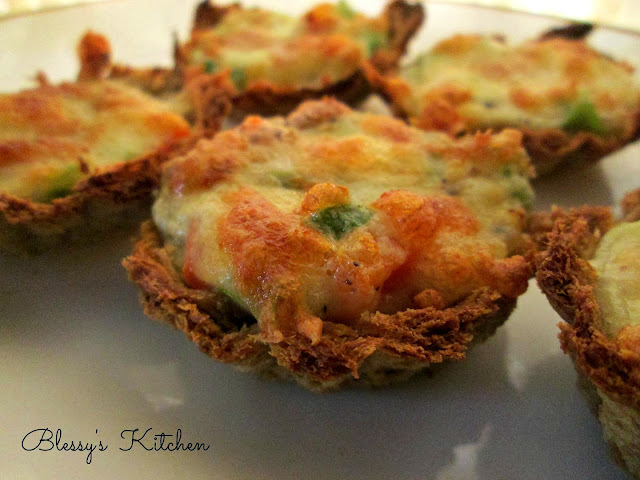 Start filling the bowls with vegetable white sauce and top it with grated cheese. Bake these Bread bowls again at 200 degrees Celsius for 10 mins. Rest Bread Bowls to Slightly cool and unmold. 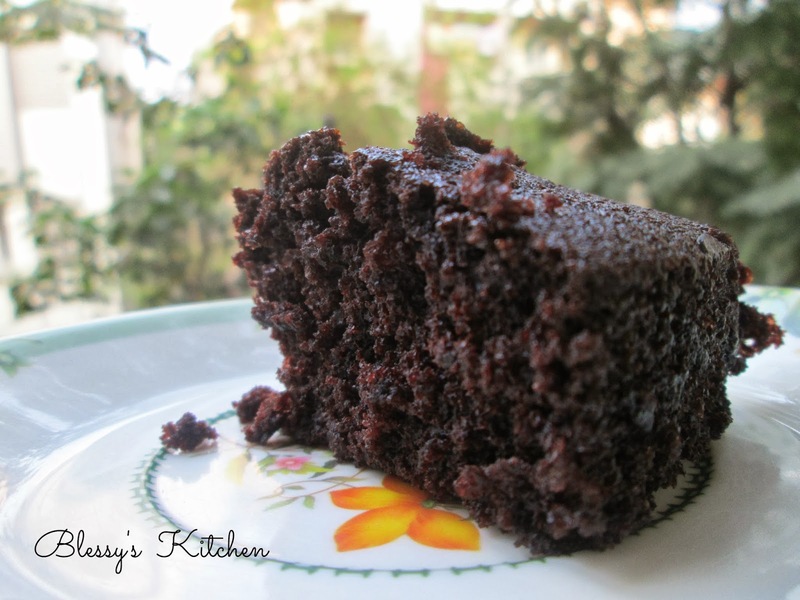 This Eggless Chocolate Cake is very delicious and super moist. In my experience this cake tastes best after about 4 to 5 hours. Begin by sifting the all purpose flour, baking soda, salt and cocoa powder into a large bowl. Take a separate bowl and add water along with sugar. 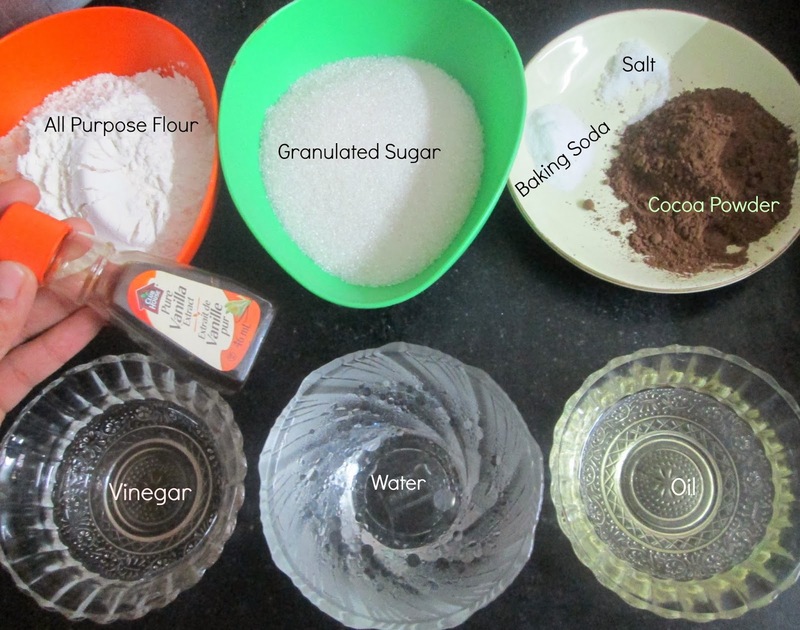 Stir this mixture continuously until the granulated sugar dissolves in the water completely. To the mixture of water and sugar, add Vinegar, oil and vanilla essence. Now add the wet ingredients to ingredients to the contents in the first bowl. Now, mix well and pour the cake batter into a greased cake tin. I used a tin made with aluminum. Preheat the oven to 150 degrees Celsius and then bake the Eggless Chocolate Cake for about 35 to 40 minutes. Keep checking the cake after about 20 to 25 minutes because temperature settings in oven vary from one other..
toothpick comes out clean it indicates that your cake is done. 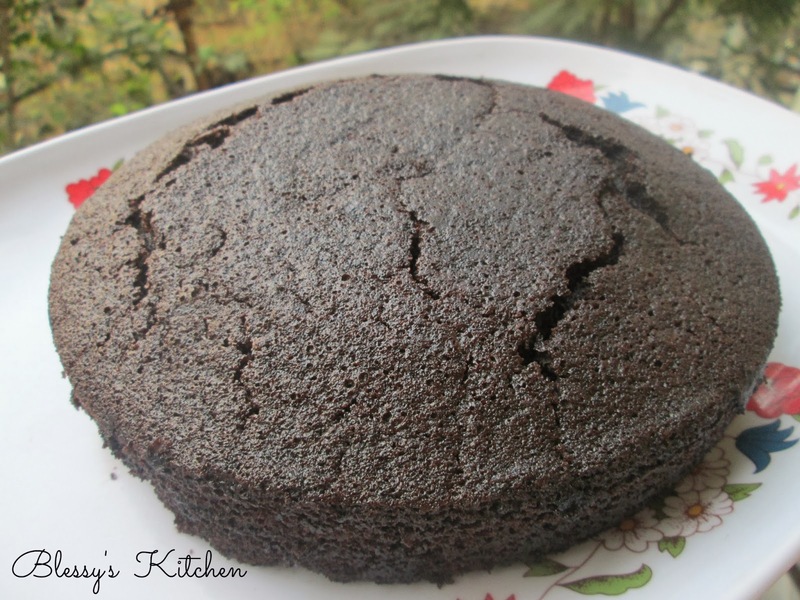 If you like the recipe of Eggless Chocolate Cake , then do let me know in your comments below. If you happen to make Eggless Chocolate Cake in other method then please let me know in your comments. Boil the Baby potatoes and Peas. Cool that mixture and make it into a fine paste. 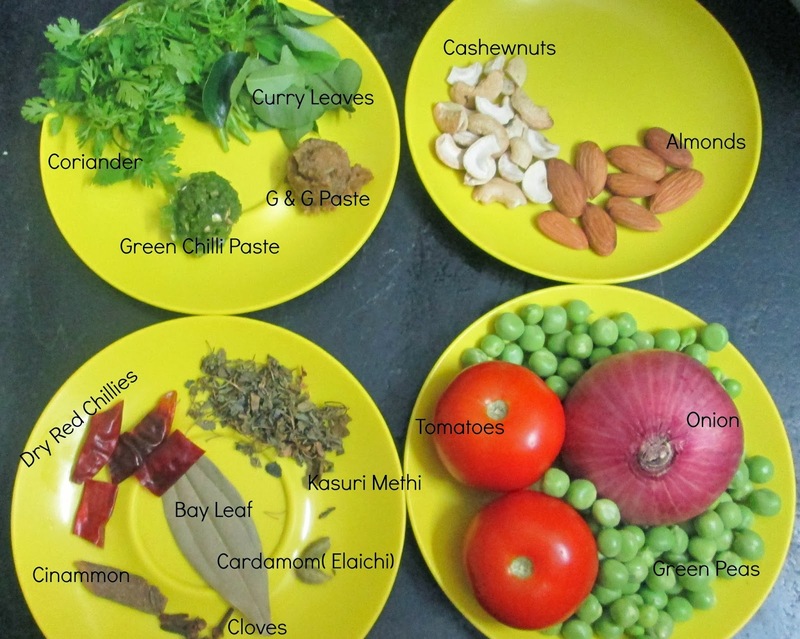 Also make fine puree of tomatoes, Cashewnuts and Almonds. Now, add oil to the hot kadai and add all garam masala’s , (except kasuri methi) curry leaves, ginger garlic paste, green chilli paste, onion paste, tomato puree and cook it until it starts to leave oil. Next add cashewnuts – almonds paste. Cook it for further 1 minute. Now add Red chilly powder, coriander powder, turmeric powder, salt, red food colour. To this mixture add boiled Baby potatoes and peas. Cook for further 2 minutes. Add cream, Kasuri methi and cook for more 1 minute. *** You can also add 1/2 Teaspoon of garam masala powder. 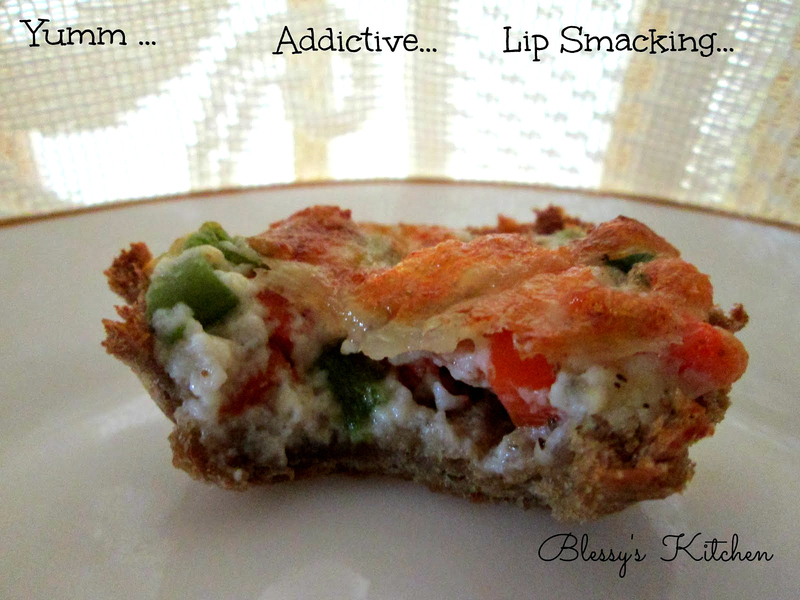 Here in the above picture i forgot to add the pic of Onion Paste and adding of cream. Do not forget to add them while you cook. 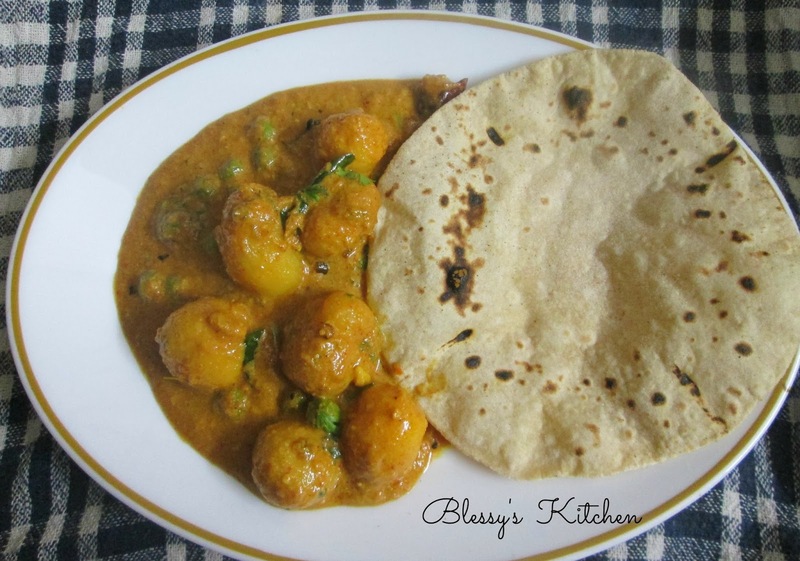 If You like the recipe of Baby Potato Curry , then do let me know in your comments below. 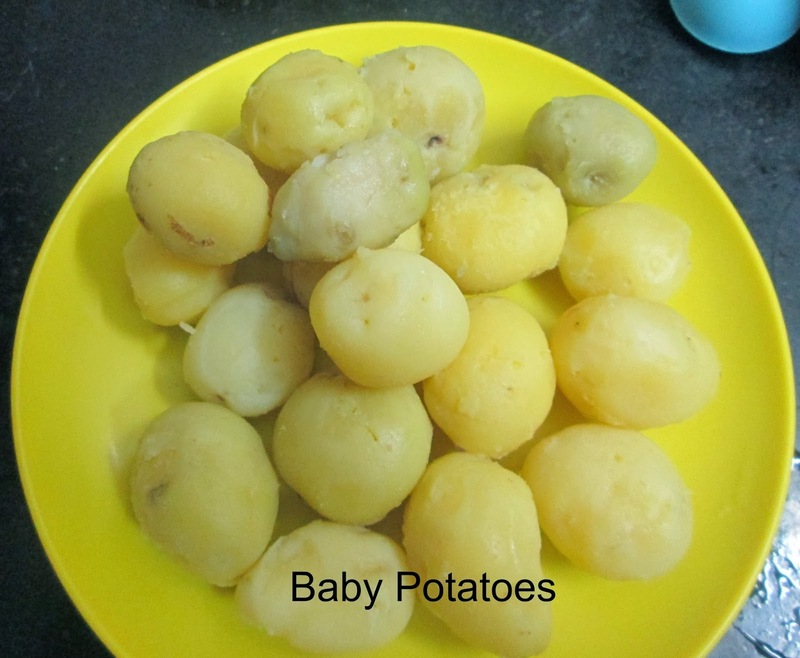 If you happen to make Baby Potato Curry in other method then please let me know in your comments. Vegetable Biryani is cooked using various spices and the cooking style may differ from place to place. Here i have cooked veggies and rice in each individual separate pots and finally piled up the rice and veggies together and pressurized (Dum) for 15 to 20 minutes . 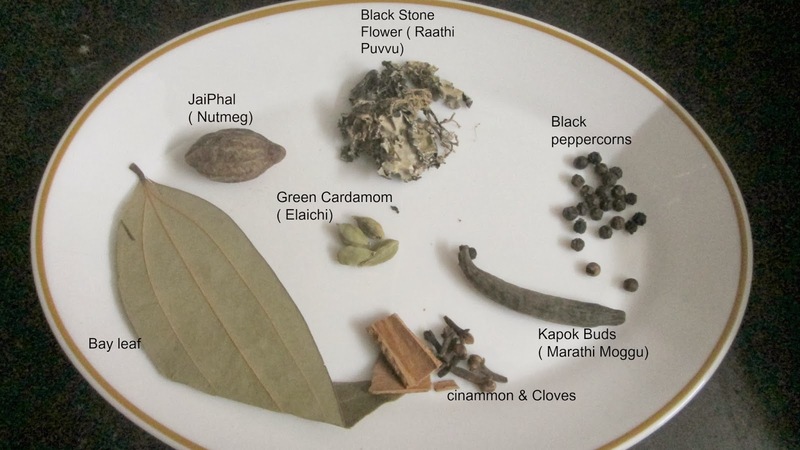 On the other hand boil water in a pot with salt, few drops of oil(water should be salty) and whole garam masala’s except nutmeg (jaiphal). 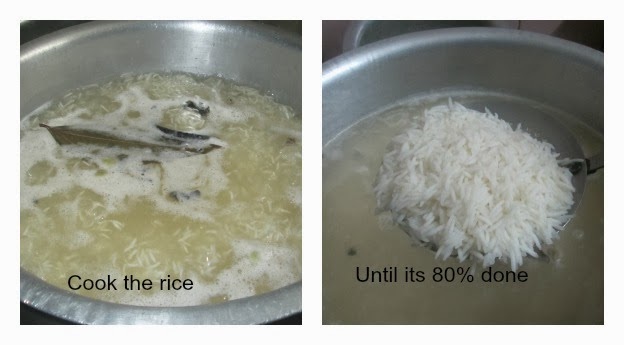 When water comes to a boil add soaked rice. 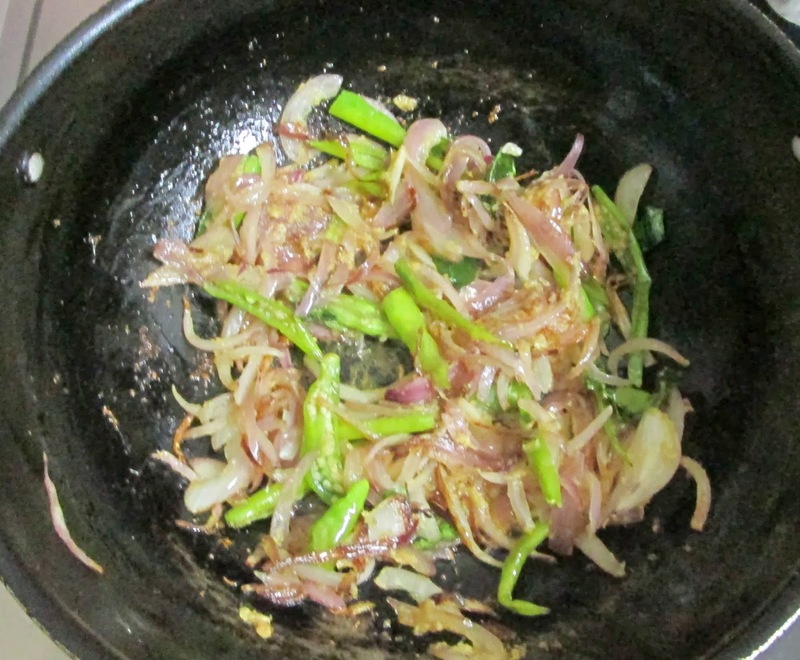 To a hot kadai add 5 tablespoons of oil followed by sliced onions, slit green chilles, ginger garlic paste. Let it cook unti it turns out brown in colour. Next add beans .Cook it till 50% done. Next add carrot and cook until 50% done. Keep an eye on your basmati rice. Cook these vegetables until they are partially roasted. Remember not to over cook the vegetables. They should not be mashy. Next add yogurt. Mix well. To this mixture add salt (you can add while frying onions for faster caramelization), red chilly powder, coriander powder, biryani masala, nutmeg powder, turmeric powder and finally cilantro and mint leaves. 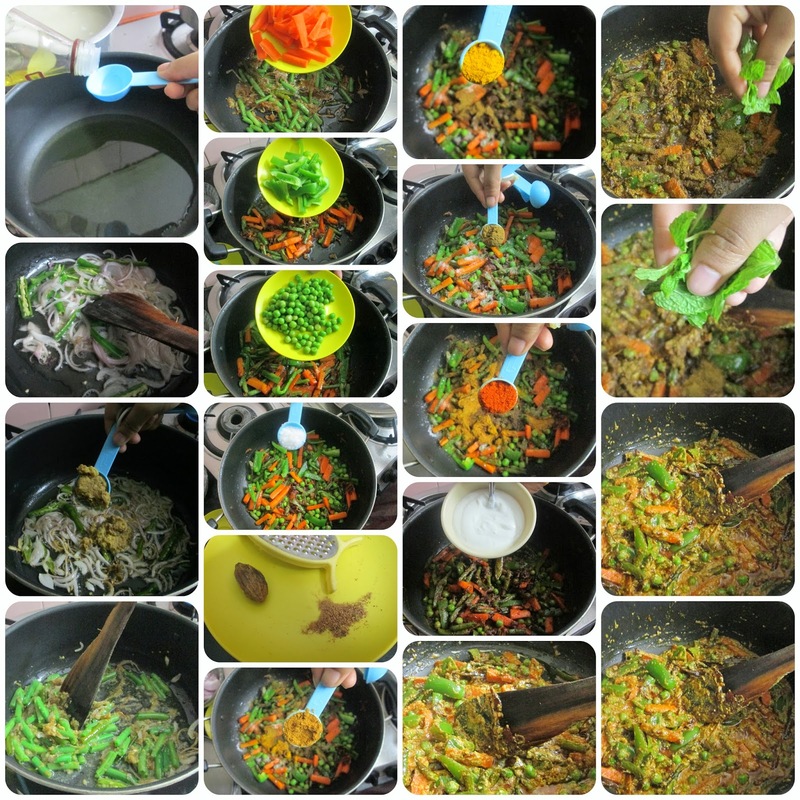 Now top the rice with vegetable mixture and repeat the process until your done with your veggie mixture and rice. Finally add cilantro leaves, mint leaves and oil/ghee, ( If using oil, use preheated oil- 1/2 cup), food colour/ ghee. Pressurize it for 15 minutes. If needed place a tawa underneath the handi for extra minutes of cooking. 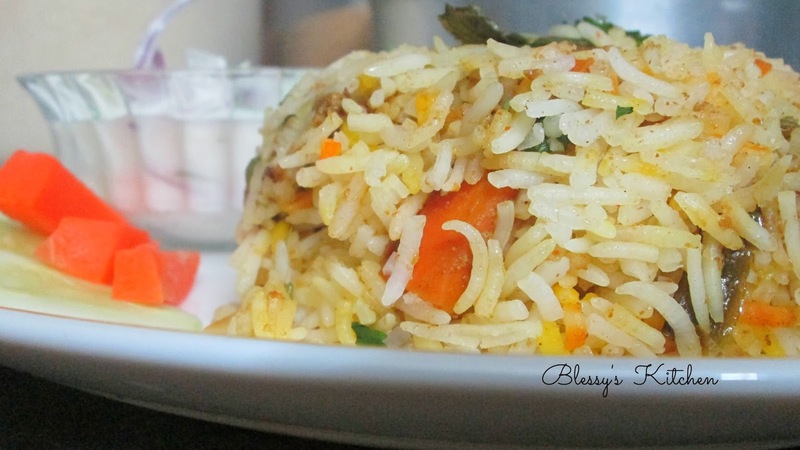 If you like my recipe of Vegetable Biryani, then do let me know in your comments below. 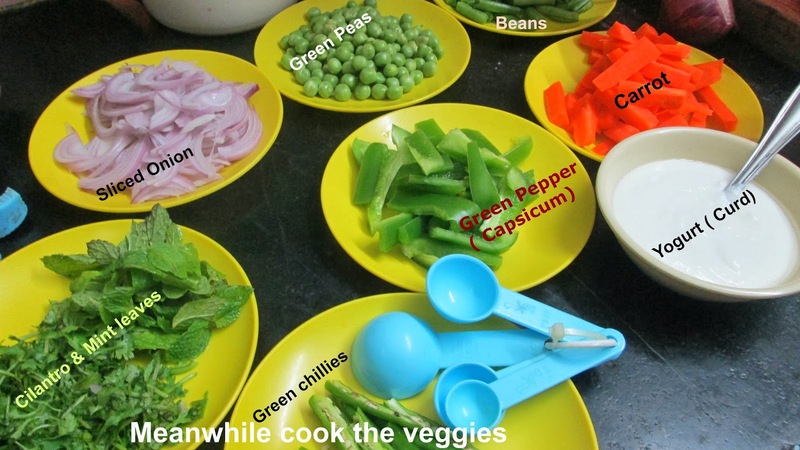 If you happen to make Vegetable Biryani in other method then please let me know in your comments. 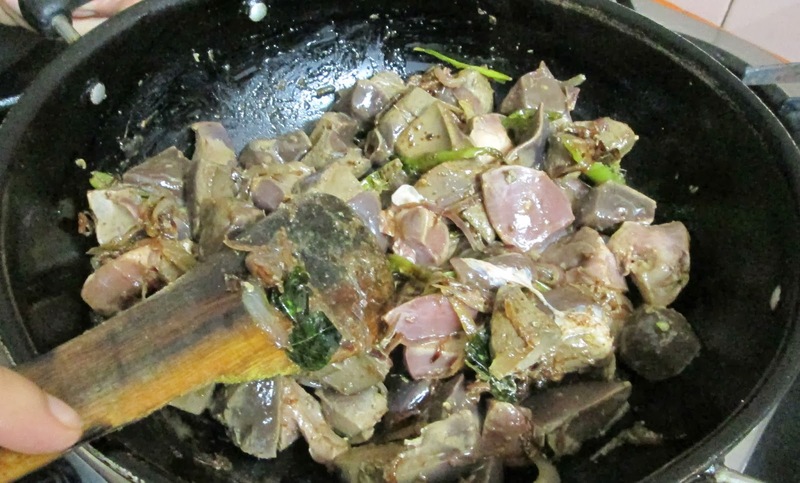 Lamb Liver contains “Vitamin A” which is essential for eyes, strong bones and teeth. On the other hand, it also contains high amounts of fat. 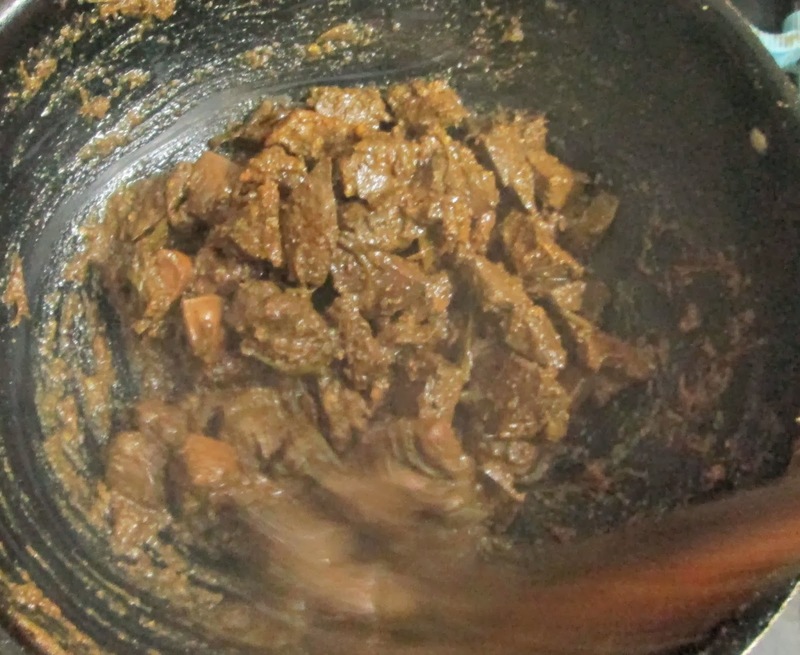 People suffering from high cholesterol are supposed to consume Lamb Liver in tiny portions. First add oil to a hot kadai. After oil gets heated, add sliced onions, curry leaves, long slit green chilies, turmeric and ginger garlic paste. Also add a little salt for the onions to cook faster. Next, add the liver and stir well. Cook with the lid on for about 15 minutes on a medium flame. Cook the liver until its size shrinks. Next, add salt and pepper, stir again and cook further for 5 to 10 minutes and you're done! 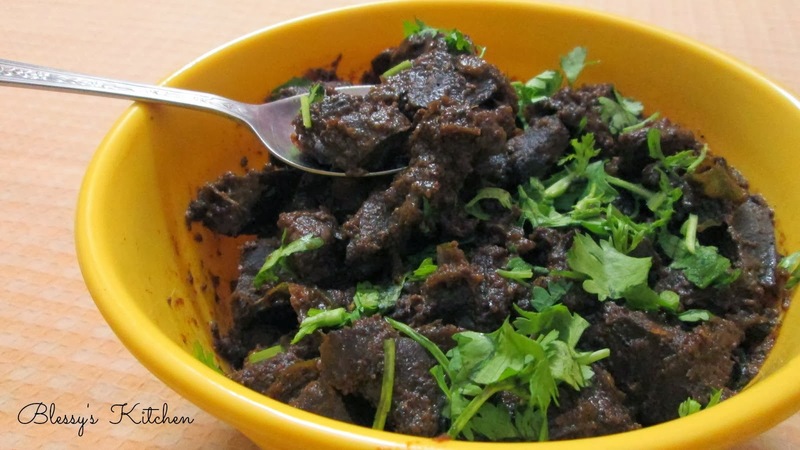 The delicious lamb liver fry is ready to be served. Do not forget to garnish the Fry with finely chopped coriander and lemon juice before serving. 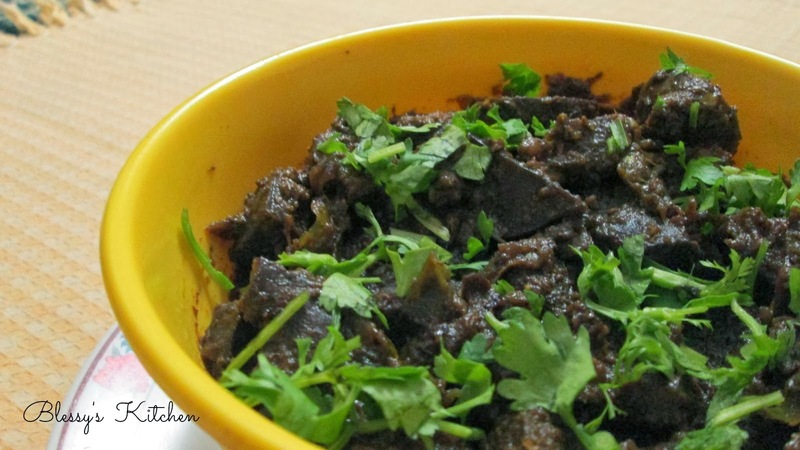 If you like my recipe of Lamb Liver Fry, then do let me know in your comments below. If you happen to make this dish in any other way, then please let me know about your method in the comments. Blessy's Kitchen. Simple theme. Theme images by i-bob. Powered by Blogger.